It’s summer, the kids are home from school, and if you are like me, the last thing you want to do is stand over a hot stove rather than spend precious time with your family. You could, of course, call the pizza delivery folks but why not make your own pizza? Making homemade pizza is quick and easy, and this Rustic Roasted Cherry Tomato Pizza, full of summery goodness, will make a believer out of you! 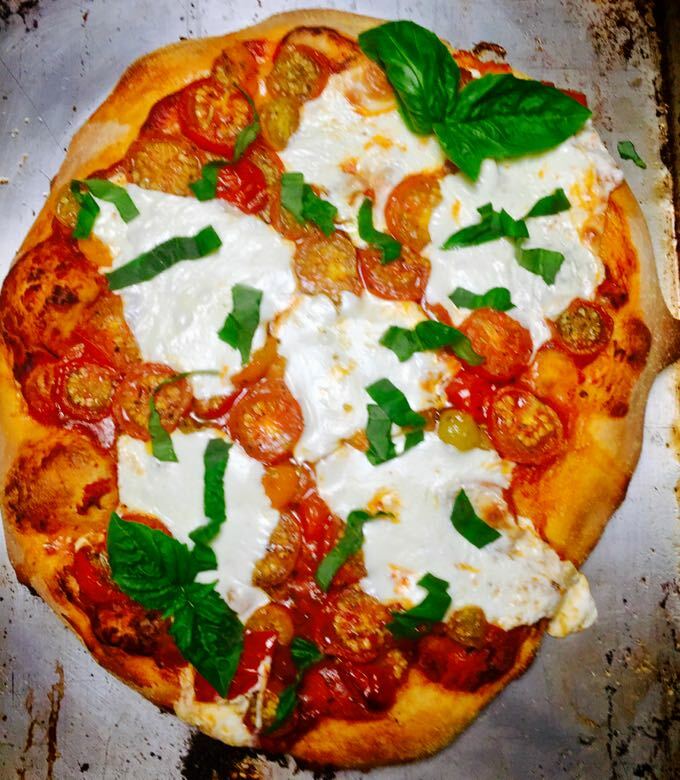 Rustic Roasted Cherry Tomato Pizza starts with store-bought pizza dough. You could make your own, but most large grocery stores and many bakeries have it made and ready to go and you get the delicious homemade pizza crust taste without all of the work. You could also use Naan bread, flatbread or a pre-made pizza crust to save even more time. But the real star of this show is the roasted cherry tomatoes. You know me and my love affair with summer tomatoes, I eat them non-stop all summer and in all manner of ways. 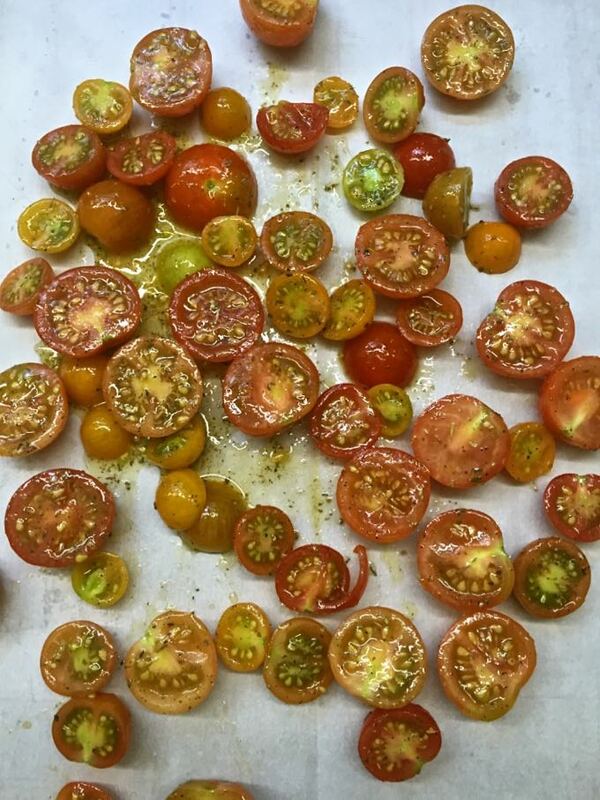 And roasted tomatoes, oh my goodness, roasting them intensifies the sweetness and makes them even more flavorful if that’s possible. Combine roasted tomatoes, melted fresh mozzarella cheese, basil and a crispy pizza crust and well, you have the makings of a delicious, fresh, healthy, and super dinner! 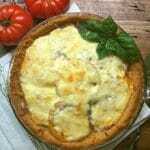 If you like tomatoes as much as I do, you might also like these yummy recipes featuring tomatoes: Southern Spicy Tomato Cheese Grits, Tomato Cobbler with Cornmeal Cheddar Biscuits, and Easy Classic Southern Tomato Pie. Thanks to a good friend of ours, Mike Coppins, who shared with us an overabundance of fresh cherry tomatoes from his garden, I’ve made not one but two different pizzas this past week. This yummy Rustic Roasted Cherry Tomato Pizza was the first, and I also made an equally delicious Chopped Salad Flatbread Pizza which I will be posting soon. The basil in this photo is actually from my garden! 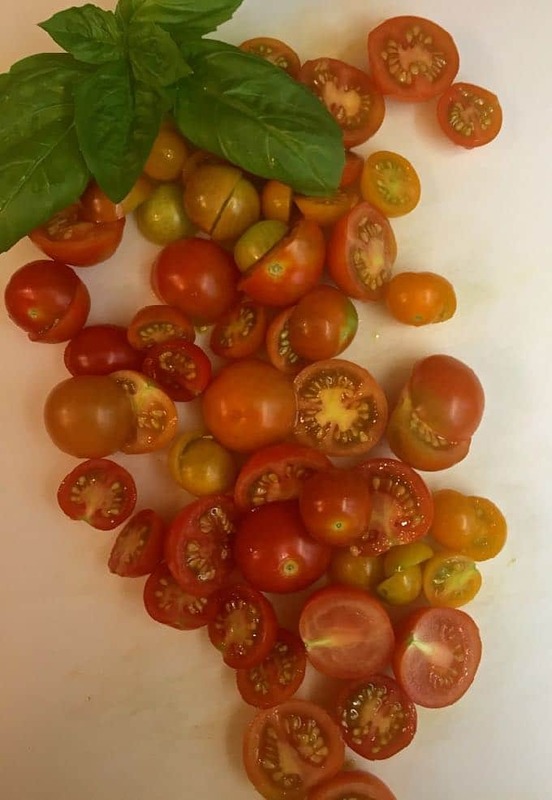 The ingredients for Rustic Roasted Cherry Tomato Pizza include, yes, you guessed it, cherry tomatoes. 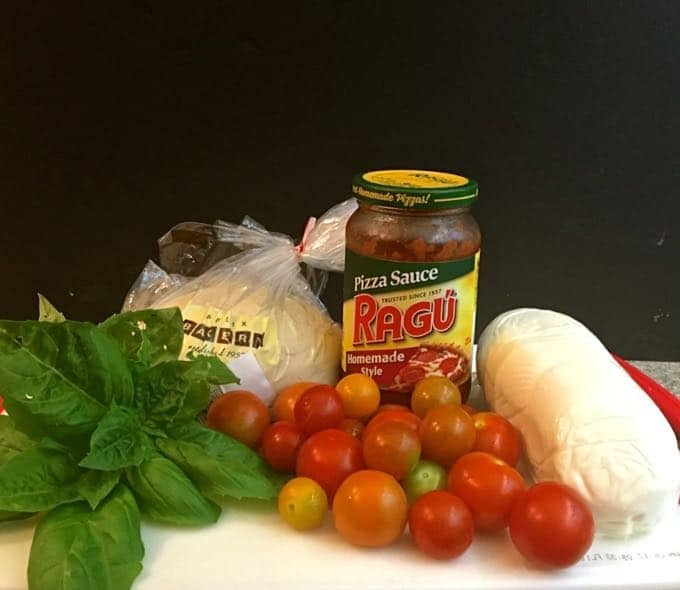 You will also need olive oil, dried oregano, kosher salt, ground black pepper, tomato sauce or pizza sauce, fresh mozzarella cheese, and fresh basil. 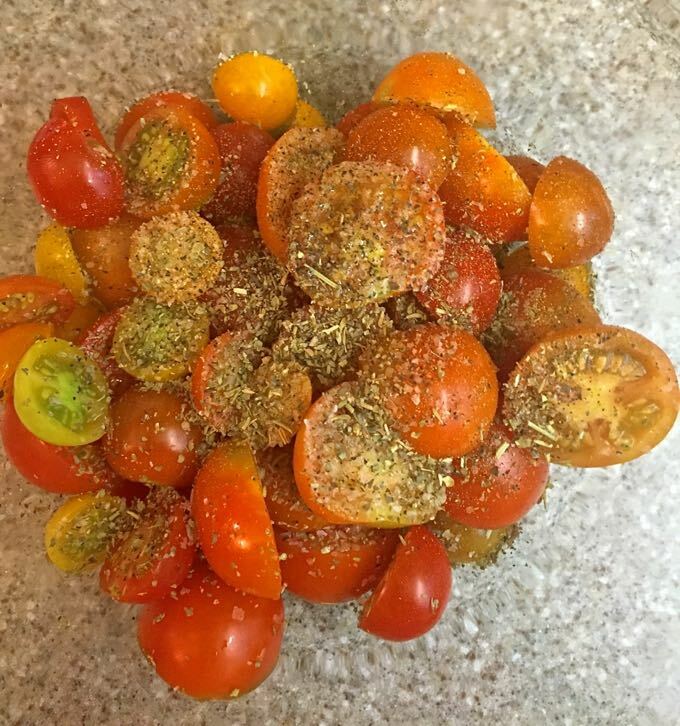 When you are ready to make this yummy pizza, gather the ingredients and preheat oven to 450 degrees F.
Combine cherry tomato slices with 2 Tbsp olive oil, salt, pepper and oregano in a medium size bowl. Mix well. 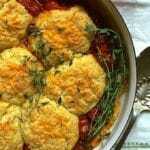 Place tomatoes on a large rimmed baking sheet and roast for 10-12 minutes. Remove from oven and set aside. Use the remaining olive oil to lightly grease a pizza pan or baking sheet. Turn dough out onto the pizza pan and, using your hands, spread it out as evenly as possible. 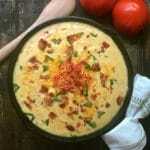 Spoon tomato sauce or pizza sauce over the dough and spread out evenly. Top with roasted cherry tomatoes and sliced mozzarella cheese. Bake for 15 to 20 minutes, or until the crust is golden brown and the cheese has melted. 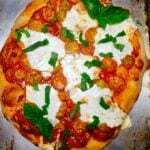 Let baked pizza cool for 5 minutes and top with fresh basil. Serve immediately. 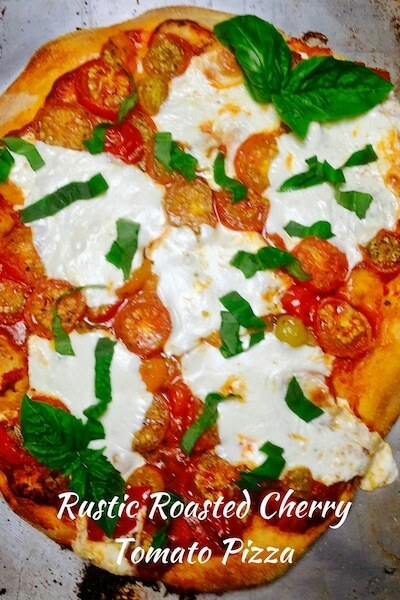 Rustic Roasted Cherry Tomato Pizza combines roasted tomatoes, melted fresh mozzarella cheese, basil and a crispy pizza crust for a delicious and healthy dinner! Top with roasted cherry tomatoes and sliced mozzarella cheese. Bake for 15 to 20 minutes, or until golden brown. 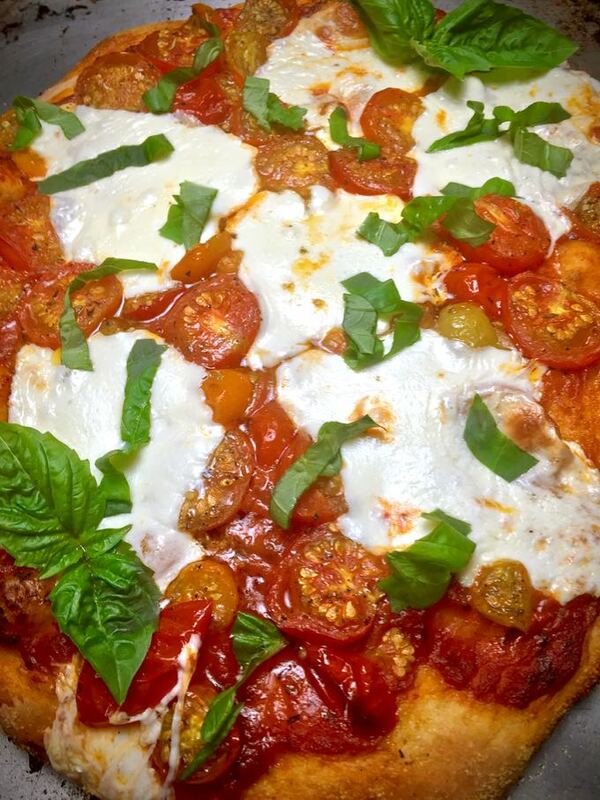 Let baked pizza cool for 5 minutes and top with fresh basil. Serve immediately. It will be easier to work with your pizza dough if you bring it to room temperature before attempting to spread it out.